As a birth doula, I have the opportunity to work in a variety of birth locations, and meet many different care providers in Baltimore and the surrounding communities. Many of the midwives I have worked alongside have inspired me in my doula work, through their dedication, knowledge, and compassionate, respectful care. 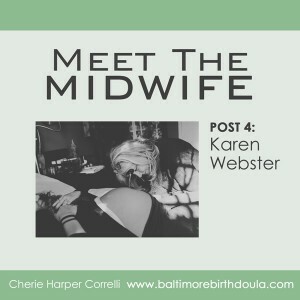 I realize that the average person looking for a care provider for pregnancy and birth doesn’t always have the same opportunity to meet the many wonderful midwives we have in the Baltimore area, so it is a joy for me to be able to introduce some of them through this series of blog posts. The fourth midwife I’d like to introduce in this series is one that holds a special place in my heart. The very first birth that I attended after completing my doula training was a homebirth, with Karen as midwife. I have often thought how incredibly lucky I was to have that experience for my first birth as a doula! It was an honor and a privilege to witness her quiet work, her gentle, wise presence, and the respect and kindness she showed to mother, baby, and all others in the room. Karen is a treasure, and we are fortunate to have her attending births here in Maryland. How long have you been a midwife, and what type of training do you have? I have been attending births for over 37 years now, and have had my own practice for around 30 years. Funny you should ask about training; I never had the luxury of a true apprenticeship with one midwife – there simply weren’t any around to train me when I started. My training was pretty eclectic. I started going to births with my first midwife – Chris Johnson, a CNM who did most of her training in the UK, when homebirths were still very common. Then I just attended births with anyone who would have me; we moved from closer to Baltimore to Elkton about 31 years ago and I met a few ‘traditional’ midwives closer to Philly and began working with them. Of course, I was also still having my own children, so it was slower going in the beginning. I consider myself a ‘community created’ midwife. Oddly, midwifery was not something I ever aspired to but after the birth of my 4th baby, a son – 10 lbs and posterior – I was captured by the power of birth. I took the first NARM exam, given in 1992 and became a CPM in June of 1995. I have remained a CPM in good standing for close to 21 years. I have also been a QE (Qualified Evaluator) for 20 years, for NARM, which means that I have administered clinical tests for other midwives who were going through the CPM credentialing process. It’s been a real privilege to hep other midwives along this path. I have also been a preceptor and faculty member for the National College of Midwifery & Birthwise for over 15 years, and have also worked with PEP process midwives since that process was in place. I am very committed to growing more midwives. Along my path to becoming and growing as a midwife, my educational path has continued and evolved, as our growth as midwives is never finished. I have learned from so many good teachers and my own students have also taught me so much. I don’t think our education ever ends. In what settings have you attended births, and where do you currently attend births? I have always attended homebirths, that’s really where my heart is, and where it will remain. There is nothing like giving birth in your own space, and being in the center of your own comfort and place of power. Currently my geographic area spans Baltimore to Philadelphia and most places in between. What is your general philosophy of labor and birth? That quote is from my website philosophy page, and I think it expresses my birth philosophy well. I would add 2 words: Surrender & Accept! Often those words apply to both mothers and midwives. Of course, as a midwife, I am the mother’s handmaiden and lifeguard, and I believe my work is to remember who is at the center of the birth experience – the Mother/baby dyad – while my job is to quietly monitor and observe, without disturbing the unfolding of labor & birth; making sure that both baby & mother are staying safe and normal. I also like to emphasize that our common goal is a healthy outcome for both, and not just a homebirth. Do you have children? If you have given birth, have your own birth(s) influenced the care you give to other women? I have 8 of my own children, plus a few who have become a part of our family through the years. Six of our eight were born at home. All 11 of my grandchildren were born at home with me as midwife, which was a surprise and honor beyond compare! Fortunately, my children grew up in a household where birth was a normal part of everyday life and they seem to have an inherent faith in the process. They are also more like my mother in law, and give birth quite easily, which is a blessing for all of us! I do think it helps that they grew up with a mother who’s also a midwife. They were all present for each subsequent siblings birth, as we really welcomed them into the birth process, if they wanted to be involved. I think it was a good thing for them! My own births were not quite as straightforward as my children’s births, and that is a good thing, because I learned so much about the wide variations of ’normal’ in labor and birth, and also learned to trust in my body and the birth process, and that has served me well as a midwife. I feel I am never more present and patient as I am at a woman’s birth. What is one thing you’d like your clients to know before they give birth? If a mother turns to me after her baby is born and says “I couldn’t have done this without you” then I have failed, because while I often wish I could take part of each woman’s labor I know clearly who does the work of birth: the Mother! Thanks so much, Karen! For more information about Karen, check out her website, www.womanwise.info, or email karen@womanwise.info, or kswmidwife@gmail.com.